The Abbey and the Museum are described elsewhere on this website and visitors will find full details displayed at these attractions. The walk described here sets out to highlight many of the other interesting historic buildings and locations around the village. 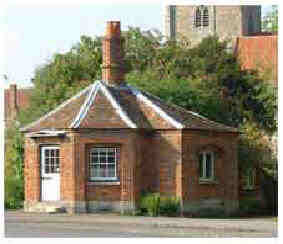 The octagonal, former Toll House was built around 1820 after the 1815 bridge was completed. Tolls were collected until 1873. The building now serves as the offices for a firm of architects. The levels of 19th century floods of the River Thame are cut into the stone on the front to the right of the entrance, November 15th 1894, and under the window at the side, November 1st 1823. Cross the main road towards the car park and proceed along Bridge End past a row of modern cottages and stop at a brick and flint built cottage with CL1715 above the entrance. There are a number of houses in Dorchester with 18th century dates showing that this was a time of village growth. We will stop at others on our walk. Continue down Bridge End past the wall on the right with heavy brick buttresses. This was the end wall of a former row of small cottages along a lane known as Albert Place. There were 14 cottages in the row in 1848 of which 9 were still standing in the 1920s when the occupants were rehoused and the buildings torn down. On the other side of the road is St. Birinus Roman Catholic church. The church was commissioned in 1848 by John Davey of the Overy Manor family. 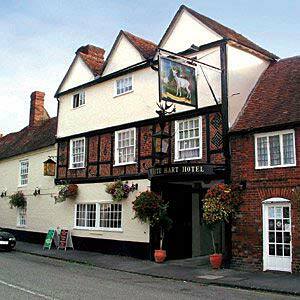 It is said that secret masses had been celebrated in the Overy Manor House about half a mile east of Dorchester. The architect of the church was William Wilkinson Wardell, a disciple of Pugin, who later designed cathedrals in Melbourne and Sydney after emigrating to Australia. John Davey also donated the splendid Presbytery next door. Ahead of us at the junction of Bridge End and Watling Lane is an imposing house in a walled garden. Bridge End Close is another of the 18th century houses although it also has Victorian additions. It is topped by a ‘sophisticated’ mansard roof. Walk to the left of the green – notice how some of the old cottages have been extended. Beyond them a cleared space leads down to the River Thame. This may have been the location of the Roman crossing of the river. It was certainly the site of the medieval bridge built in the reign of Edward III and demolished in 1816 after the new bridge had been opened. The route we have been following was until then the main road through the village. Because it was replaced by the new bridge in 1815, this spot came to be known as ‘Waterloo’. It is said that at very low water it is possible to see the foundations of the old bridge. Continuing clockwise round the Green you come to Lantern Cottage which incorporates what used to be a Primitive Methodist Chapel, built in 1839. Opposite is a picturesque row of cottages. An archway next to No.28 contains a fireplace and was until 1954 the downstairs room of a cottage whose only other room was the one which remains over the archway. At the end of the Green is a cul-de-sac with two old cottages at the end.Leading off to the right is a footpath to Wittenham Lane where turning left and proceeding to the edge of the field gives a view in the distance of the Dyke Hills, which bordered the Iron Age settlement on this side of the river, and of the Iron Age fort, Castle Hill, across the river. However, all that is the subject of another walk. For now return up Wittenham Lane to its end at Watling Lane. Turn Left and after a short distance turn right into Samian Way. Croft Cottage on the left is the first of the identifiable medieval cottages on this walk evidenced by its cruck construction. Mollymops across the way is another 18th. century building built of chalk, flint and brick. The next cottage beyond was made from three of the old Albert Terrace hovels. Go up the path to the left side of Mollymops to reach the Allotments which cover the southwestern section of the town which grew up around the Roman Fort. Excavations have located the fort, a stone town-wall and foundations of several Roman buildings. Continue up the allotment path and turn right to reach Rotten Row. Mayflower Cottage on the left has a 17th-18th century lobby entrance. Across the street past a large modern garage is the fourth of the dated 18th century buildings in the village. This was once a pub called the Farmer’s Man and has the date 1781 carved in the brickwork just outside the garden gate. The Old Cottage opposite is a timber framed house with a new brick front. Note the shape of the roof. Walk up Rotten Row to the vehicle entrance of the Fleur-de-Lys. This is an old inn where travellers could stay and there was stabling for horses. The former is still possible but the stables have long gone. However car parking is provided. In the vehicle entrance passage a lone leg of a cruck frame can be seen marking the former frontage of the building some 7 or 8 feet back from the current line and lining up more or less with the terrace of medieval cottages which is next on the walk. This terrace of four medieval cruck-framed cottages was in single occupation at the time of the 1846 Tithe Award, described as ‘House and Premises’ The wide steps up to the ground floor level in the centre section of the terrace suggest a ‘grander’ entrance at some time. 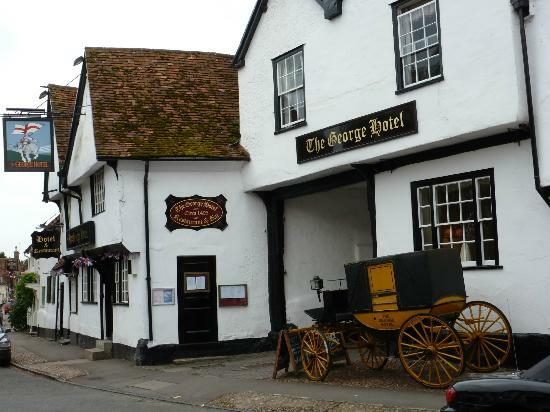 The George, construction of which started in 1495, is a fine medieval building and one of several coaching inns to be found in Dorchester. Inside the courtyard on the left, the original gallery range still survives. Notice also the jettied upper floors at the street frontage. Continue up the High Street to the building at numbers 33/35. The carriage entrance suggests that it might previously been the house of an important Dorchester person. Number 37 beyond has the only surviving early shopfront remaining in Dorchester. It was previously a bootmaker’s shop/workshop with living accommodation above. Number 39, now one residence was previously two such premises. Notice the difference in the window arrangements to each side of the entrance. Just across the street is an imposing building with decorative brickwork that has housed Hallidays Antiques showrooms for many years but is soon to be converted to appartments. This 18th century house was adapted and extended in 1878 by the architect Sir George Gilbert Scott to form a Missionary Training College. The timbered and tile-hung house on the other corner of Queen Street which housed the college Vice-principal and Chaplain was also Scott’s work. This is now a private residence, Church House. If you allow your eye to follow the line of Church House past the Post Office and on to the roof of the Georgian fronted house, The Priory, you will see how a new frontage almost as deep as a small room has been added to an earlier building. Several buildings in the village have been similarly ‘modernised’ at different times to match the fashion of the period. Also across the road but a little further up the High Street is the White Hart Hotel another coaching inn. Its decorative herring-bone brickwork proclaims a date 1691 but this is when the brick infill replaced earlier wattle and daub for the building is much older. Formerly there was a long range extending back as far as Queen Street and enclosing a yard in a similar fashion to the George. The buildings on the south side of the coaching entrance became part of the hotel in more recent times. Continue up the High Street to the wide coach doors between Bullyn (57) and Bull Cottage (59). Bull Cottage has a gallery on the back similar to that seen at the George but now encased in the house. The front of this section of the old inn has been rendered but next door and also on No.55, which may also have once been part of the inn, the rendering has been removed to expose the timberwork. No.55 is a splendid building, jettied on two floors with carved scrolled brackets. Across the street was another large inn, the Crown. 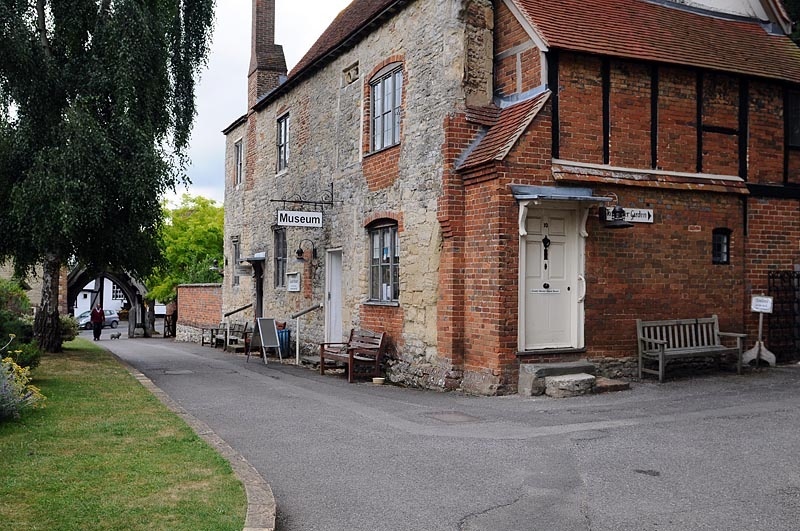 Crown House on one side of the coach entrance and the former shop on the other now take up what was the front of the old inn where the Defiance stage coach from London used to stop. The Crown continued to operate as a pub into the 1950’s. Continue up the High Street to the War Memorial at the junction with Watling Lane. A few yards further on the left is Willoughby House with its false stone rendered front; another example of period ‘modernising’. As can be seen through the open wagon gate, the original house was timber framed. A later section built of brick was added at the north end and both fronts were covered with an 18th. century façade of false stone with a pillared entrance porch. Its division into two residences is a recent development. Across the street is an old farmhouse now called the Old Forge, a 16/17th century lobby entrance building and Tudor Cottage, a medieval cruck framed building. Passing a superb example of a thatched cob wall on the left, about a hundred yards north is the entrance to an avenue of horse chestnut trees leading to Bishop’s Court Farm. According to tradition the farm is located on the site of the Bishop’s Palace when Dorchester was a cathedral town. Retrace your steps and turn down Watling Lane. On the right are some of the fields of Bishop’s Court Farm where mares and foals may sometimes be seen, for Arab horses are bred at this farm. Stop at the thatched cottage, Orchard Cottage, joining which in 1837 they built a Baptist Chapel using cob, now incorporated into the house. Turn left up the path known as Malthouse Lane. On the left is Cob Cottage which is constructed just as its name suggests and has walls 14 inches thick. A side garden wall of cob may be seen extending along one side of the front garden. Continuing down the Malthouse Lane path there is a group of five new houses on the left. This is on a former wheelwright’s yard, later a blacksmith’s and then a motor repair yard in which the old forge remains. To your right there is a terrace of seven small but very attractive cottages with an average frontage of about 15 feet. In the 19th. century this was a single building housing a Malthouse where barley was malted for brewing.The last cottage in the row, No.16, which is larger than the others, was probably the house of the Maltster Turn left, walk past two old thatched cottages and return to the High Street to end the walk.